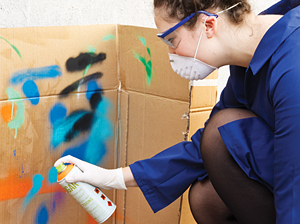 Always wear a Respirator and Gloves when using spray paint. 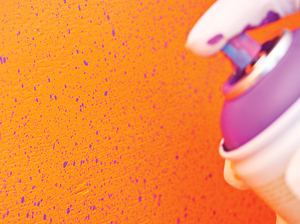 Spray outside or in a well-ventilated area. 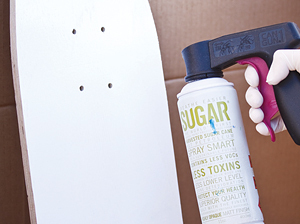 Spray the skateboard with one coat of white paint. 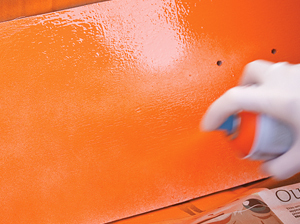 Attaching a Spray Can Gun will make this process faster. 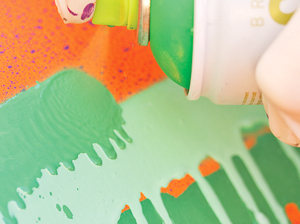 Shake each can for 2 minutes before spraying to ensure the pigments are mixed. 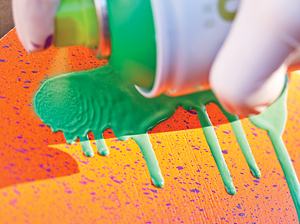 Create a speckled effect by varying the pressure and nozzle used. Holding the can back further creates a lighter spray. 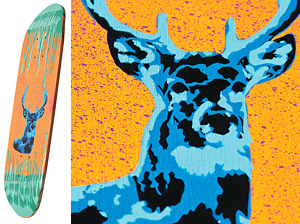 Create drips by spraying very close to the skateboard and allowing the paint to pool and run. Layer on more colour using the same method until you are happy with the result. Use a spray adhesive to tack the mid tone stencil to the surface. Spray the paint using short quick sprays from the outside of the stencil. Work your way around all sides. Be careful not to over spray. 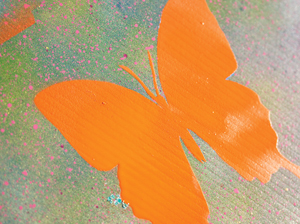 Remove the stencil and allow paint to dry. Use a spray adhesive to tack the shadow stencil to the surface. Spray this stencil while being careful not to over spray. 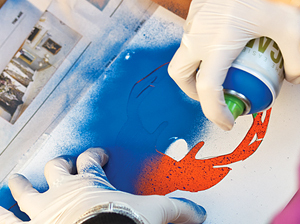 Remove the stencil and allow paint to dry. 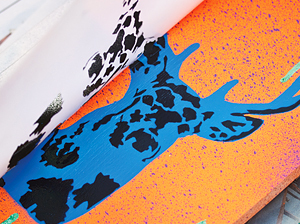 Use a spray adhesive to tack the highlight stencil to the surface. 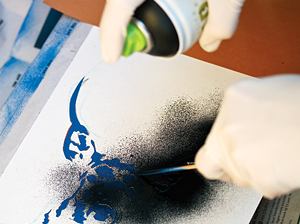 For fine areas use a satay stick to hold pieces of the stencil down. 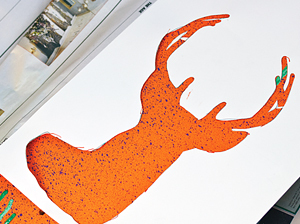 Remove the stencil and allow paint to dry. Your skateboard deck is now ready to display. 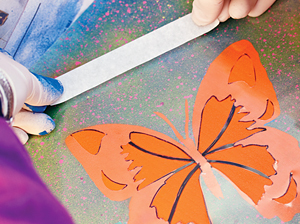 Tape your acetate stencil to the surface with Masking Tape. Spray paint using short quick sprays from the outside of the stencil. 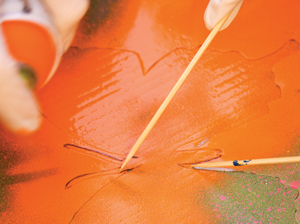 For fine areas use a satay stick to hold pieces of the stencil down. 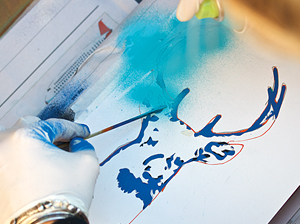 Remove the stencil and allow paint to dry. Be careful not to over spray. 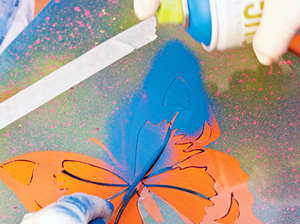 Remove the stencil and allow paint to dry. 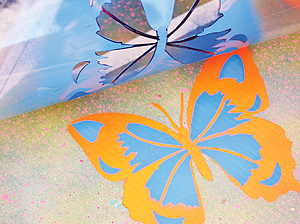 Tape the next layer stencil to the surface, lining up the images easily through the acetate. Spray this stencil while being careful not to over spray.